Do you remember the good old days when we had direct trains to Charing Cross? One group of people misses that late night West End train more than most - the theatre performers who find Forest Hill the perfect place to live. Forest Hill Society member, Mark Stevenson, who works with Teatro Vivo and Ampersand explains what makes SE23 so attractive. My home is as near as you can get to Lower Sydenham whilst still officially being in Forest Hill and on my street alone I know several actors, musicians and dancers - Forest Hill is crawling with us. Look around the train into London and chances are you'll see an actor silently mouthing their lines on their way to rehearsals or a musician strapped to a large and very oddly shaped instrument case. Straightforward economics play a part here. Performers want a place they can afford and where they don't actually have to live in a garret. That’s especially true if you're a musician who needs a large space for your instrument and tolerant neighbours when you need to practise. Then there are the trains giving us easy access to the South Bank and the West End. Mind you, since we've lost the direct train from Charing Cross, one actor I know has chosen to cycle instead, cutting out the draughty wait at London Bridge. It's helpful living in a community near other performers. You can try out ideas, share props, exchange scripts and have a moan about arts funding over a pint in the local pub. Performers do like to stick together! As soon as a place is discovered (nice housing, leafy gardens, decent takeaways) the performers’ network swings into action to spread the word. If you ever need to get some information out there, just mention it to an actor - it's by far the best way to reach as many ears as possible! As for performance spaces, there’s the Brockley Jack Theatre and The Albany in Deptford close to hand. The Catford Broadway has a great range of shows in their studio and main house, and London Bubble always make sure they visit Sydenham Wells Park with their outdoor summer show. We also now have the fabulous Arcola (in Dalston) within easy reach thanks to the East London Line. Perhaps because of all this, there are now several theatre companies based in the area - 'Bold & Saucy', 'Spontaneous Productions', 'Teatro Vivo', and my own company 'Ampersand'. I work mainly with companies that perform in non-theatre spaces. I directed Teatro Vivo's 'Supermarket Shakespeare' in Forest Hill Sainsbury's and Ampersand's 'Headlines' in The Dolphin on Sydenham High Street. Spaces that people use everyday get transformed into magical places. And audiences interact directly with the action - one lovely man coached one of our (tense) characters in the supermarket in relaxation techniques right in the middle of a scene; kids tell off our grown-up characters, elderly ladies have given advice on love. For me, it feels like this is the theatre I want to make, where the community has as big a part to play as the actors, especially the community where we are most at home. 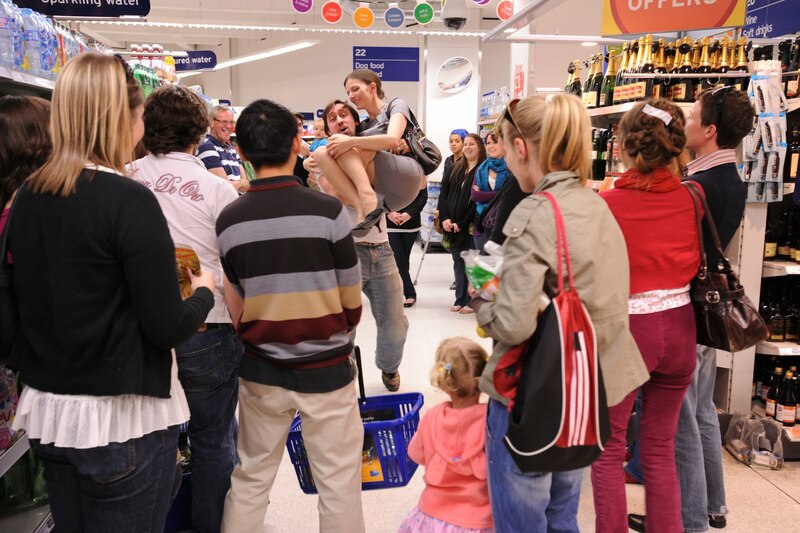 Photo: Teatro Vivo perform Supermarket Shakespeare in Sainsbury’s. Photograph by Tim Sutton.